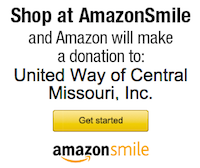 United Way of Central Missouri is proud to partner with KRCG on the Stop Buylling Mid-MO initiative. Each month, KRCG will air an anti-bullying segment featuring topics associated with bullying and how the United Way and its partner agencies have seen first-hand the impact it has had on children and teens in our community. To learn more, visit KRCG's website at krcgtv.com/news/stop-bullying-mid-mo. Through these segments, KRCG and United Way hope to raise awareness about the issue and help 'stop bullying in mid-MO'.